수면 무호흡증(睡眠無呼吸症, sleep apnea, sleep apnoea) 또는 수면 무호흡(睡眠無呼吸)은 잠을 자는 동안에 호흡이 일시적으로 멈추거나 불규칙하게 숨을 쉬는 등의 특징을 나타내는 수면 장애의 하나이다. 숨 쉬는 동안 일시적으로 멈추는 일이 수초에서 수분까지 지속될 수 있으며 정의 상으로는 한 시간 안에 적어도 5번 발생할 수 있다. 종류에 관계 없이 수면 무호흡증을 겪고 있는 사람은 잠에서 일어날 때에도 호흡에 어려움이 있다는 것을 인지하는 일은 드문 편이다. 수면 무호흡증은 사건을 목격한 다른 사람들에 의해서, 아니면 신체에 미치는 영향에 의심이 듦에 따라 문제로 인지된다. 수면 무호흡증은 성인뿐 아니라 일부 어린이에게도 영향을 미친다. 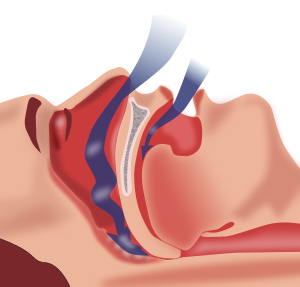 ↑ “Sleep Apnea: What Is Sleep Apnea?”. 《NHLBI: Health Information for the Public》. U.S. Department of Health and Human Services. May 2009. 2010년 8월 5일에 확인함. ↑ “Sleep Apnea: Key Points”. 《NHLBI: Health Information for the Public》. U.S. Department of Health and Human Services. ↑ El-Ad B, Lavie P (2005). “Effect of sleep apnea on cognition and mood”. 《International Review of Psychiatry (Abingdon, England)》 17 (4): 277–82. PMID 16194800. doi:10.1080/09540260500104508. 이 문서는 2017년 11월 20일 (월) 05:58에 마지막으로 편집되었습니다.